On March 4, 1675, the English King Charles II appoints John Flamsteed to “The King’s Astronomical Observator” – the first English Astronomer Royal, with an allowance of £100 a year. In the same year, the Royal Greenwich Observatory was founded and Flamsteed laid the foundation stone. John Flamsteed was born the only son of the merchant Stephen Flamsteed and his first wife Mary Spadman from Denby in the county of Derbyshire. 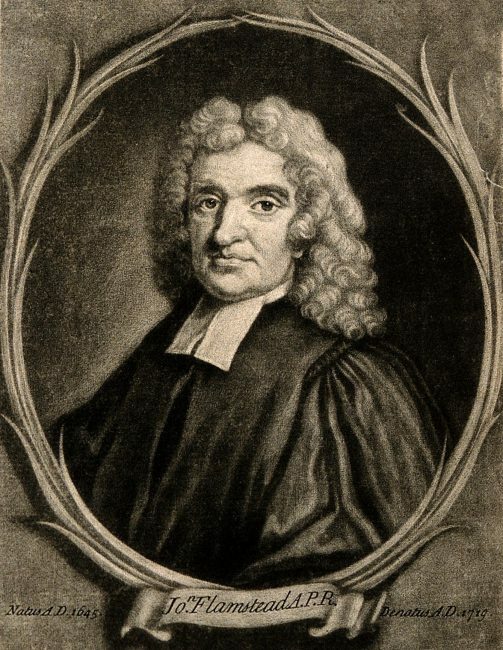 John Flamsteed’s early interests concentrated mainly on the fields of history and languages, especially Latin. By the Master of the Derby School, he was recommended to continue his education at the Jesus College at Cambridge. Before enrolling however, Flamsteed helped out at his father’s business, where he gained significant interest in mathematics and astronomy. 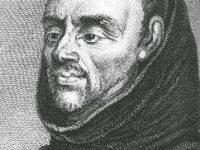 To his early influences counts the scholar, monk, astronomer, and teacher at the University of Paris, Johannes de Sacrobosco. Flamsteed especially enjoyed his ‘De spaera mundi‘, an introduction to the basic elements of astronomy. Other critical influences to Flamsteed were Thomas Street’s ‘Astronomia Carolina‘ or the astronomical tables by Jeremiah Horrocks. Flamsteed’s first paper in the field of astronomy was titled ‘Mathematical Essays‘ and was published in 1665. In self-study he taught himself how to calculate eclipses and planetary positions. Somehow some of these calculations fell into the hands of the astronomer and mathematician Immanuel Halton (1628-1699), who was enthusiastic about the young talent’s abilities. Lord Brouncker, the then president of the Royal Society, also heard about it, and there was an exchange of letters with various scholars in London, including Henry Oldenburg, John Collins and William Molyneux. At the age of not even 23, Flamsteed set off to meet the men of the Royal Society in person. When Flamsteed prepared to take up a living in Derbyshire, he was invited to London and appointed “The King’s Astronomical Observator” in 1675. In the same year, at Flamsteed’s suggestion, another royal decree established the Royal Greenwich Observatory, for which Flamsteed laid the foundation stone in August. In February 1676 he became a member of the Royal Society and in July he moved to the observatory where he lived until 1684 when he was appointed pastor of the Burstow parish in Surrey. Flamsteed is also known for his dispute with Isaac Newton, who was then President of the Royal Society. As Astronomer Royal, Flamsteed managed to gather numerous information on stars and recorded them in his star catalogue. Flamsteed did not indent to publish his data yet, since he was not completely sure they were as exact as he wished. Still, Isaac Newton, and Edmund Halley  obtained Flamsteed’s data and published his star catalogue. However, Newton tried to pass some of Flamsteed’s observations off as his own, which he did with the help of a royal edict; Newton arranged for Flamsteed’s observations to be published. He then published them without naming Flamsteed as the discoverer. Years later Flamsteed managed to buy back most of the copies of the published books, and he finally burned them publicly in front of the Royal Observatory. In 1725, Flamsteed’s own version of Historia Coelestis Britannica was published posthumously. The work included a catalogue of almost 3000 stars with a remarkable accuracy and further observations by Flamsteed. It was considered the first significant contribution of the Greenwich Observatory, and the numerical Flamsteed designations for stars that were added subsequently to a French edition are still in use. During his active years of research, Flamsteed calculated the solar eclipses of 1666 and 1668 very accurately. Also, the scientist was able to sight the planet Uranus several times, but unfortunately mistook the planet for a star, which he catalogued as ‘34 Tauri‘. In the 1680s, it was Flamsteed, who proposed that the two great comets observed in November and December of 1680 were not separate bodies, but rather a single comet traveling first towards the Sun and then away from it. Isaac Newton firstly disagreed with him, but later on agreed with him, theorizing that comets, like planets, moved around the sun in large, closed elliptical orbits. Legend has it that Charles II ordered the Tower Ravens to be killed when John Flamsteed discovered their droppings on his telescope, but when he was told a legend said that if the ravens ever left the Tower, the White Tower, the monarchy and the entire kingdom would perish, he was persuaded not to. John Flamsteed held the office of Astronomer Royal until his death on December 31, 1719. At yovisto academic video search, you may enjoy the video lecture ‘E.T Are you out there?’ at the Royal Astronomical Society by Dr David Mannion. Atlas Coelestis, 1729 edition – Full digital facsimile, Linda Hall Library.